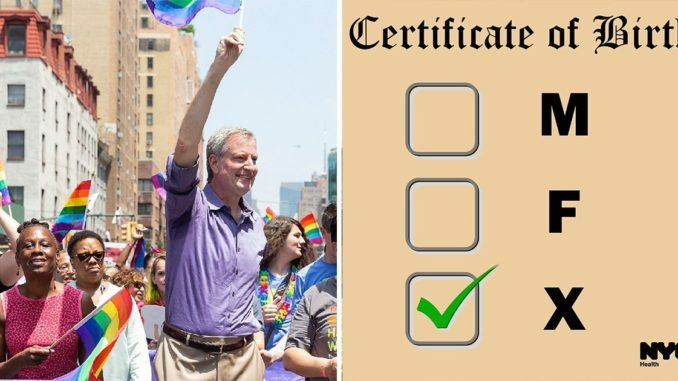 A new law in New York City has made it easier for transgender and non-binary people to match their birth certificate to their gender identity without needing a signed affidavit from a doctor. The new law allowing the choice of “X” took effect on Tuesday and also allows parents to choose “X” for newborns. New York has joined California, Washington, and Oregon in permitting a third category for birth certificates. RT reports: New Yorkers can change their gender to “X” by merely attesting that it represents their “true gender identity,” where previously they required a doctor’s note to make the switch legally. Parents can opt for the “X” for their newborns without the sworn statement. Those unlucky enough to be born outside New York will have to wait for restrictions to loosen still further. Since 2014, New York residents have been able to legally switch genders with only a note from a medical or mental health professional. Previously, they were required to undergo surgery before they were allowed to make the switch. Others took a dimmer view of the move.